Jean Baudrillard (July 29, 1929 – March 6, 2007) (IPA pronunciation: [ʒɑ̃ bo.dʀi.jaʀ]) was a French cultural theorist, philosopher, political commentator, and photographer. His work is frequently associated with postmodernism and post-structuralism. Post-structuralism, while critical of Structuralism, also takes is cue from the work of Swiss linguist, Ferdinand de Saussure. Unlike the Structuralists, their attitude toward meaning is characterized by suspicion, rejecting the notion of inherent and stable structures of meaning. While few have actually embraced the term, the work of post-structuralists tends toward demonstrating the fallacy of meaning, or the ways that meaning tends to break down. Baudrillard's hyper-realism builds on these notions, as he critiqued the standard Marxist interpretation of capitalism for one that focused on consumerism. Jean Baudrillard was born to a peasant family in Reims, north-eastern France, on July 29, 1929. He became the first of his family to attend university when he moved to the Sorbonne University in Paris There he studied German language, which lead to him to begin teaching the subject at a provincial lycée, where he remained from 1958 until his departure in 1966. While he was teaching, Baudrillard began to publish reviews of literature, and translated the works of such authors as Peter Weiss, Bertold Brecht, and Wilhelm Muhlmann. Toward the end of his time as a German teacher, Baudrillard began to transfer to sociology, eventually completing his doctoral thesis Le Système des objets (The System of Objects) under the tutelage of Henri Lefebvre. Subsequently, he began teaching the subject at the Université de Paris-X Nanterre, an (at the time) politically radical institution which would become heavily involved in the events of May 1968. At Nanterre, he took up a position as Maître Assistant (Assistant Professor), then Maître de Conférences (Associate Professor), eventually becoming a professor after completing his habilitation, 'L'Autre par lui-même' (The Other, by himself). In 1986, he moved to IRIS (Institut de Recherche et d'Information Socio-Économique) at the Université de Paris-IX Dauphine, where he spent the latter part of his teaching career. During this time, he had begun to move away from sociology as a discipline (particularly in its "classical" form), and, after ceasing to teach full time, he rarely identified himself with any particular discipline, although he remained linked to the academic world. During the 1980s and '90s his books had gained a wide audience, and in his last years he became, to an extent, an intellectual celebrity. He was published frequently in the French and English speaking popular press. He nonetheless continued supporting the Institut de Recherche sur l'Innovation Sociale at the Centre National de la Recherche Scientifique and was Satrap at the Collège de 'Pataphysique. He also collaborated at the Canadian philosophical review Ctheory, where he was abundantly cited. He died of illness on March 6, 2007, at the age of 77. Jean Baudrillard was a social theorist and critic best known for his analyses of the modes of mediation and of technological communication. His writing, although consistently interested in the way technological progress affects social change, covers diverse subjects—from consumerism to gender relations to the social understanding of history to journalistic commentaries about AIDS, cloning, the Rushdie affair, the (first) Gulf War, and the attacks on the World Trade Center in New York City. His published work emerged as part of a generation of French thinkers such as Gilles Deleuze, Jean-Francois Lyotard, Michel Foucault, and Jacques Lacan, who all shared an interested in semiotics, and he is often seen as a part of the poststructuralist philosophical school. In common with many poststructuralists, his arguments consistently draw upon the notion that signification and meaning are both only understandable in terms of how particular words or "signs" interrelate. Baudrillard thought, as many post-structuralists did, that meaning is brought about through systems of signs working together. Following in the footsteps of structuralist linguist Ferdinand de Saussure, Baudrillard argued that meaning is based upon an absence (so "dog" means "dog" not because of what the word says, as such, but because of what it does not say: "Cat," "goat," "tree, and so on"). In fact, he viewed meaning as near enough self-referential: Objects, images of objects, words, and signs are situated in a web of meaning; one object's meaning is only understandable through its relation to the meaning of other objects. One thing's prestigiousness relates to another's quotidianity. From this starting point, Baudrillard constructed broad theories of human society based upon this kind of self-referentiality. His pictures of society portray societies always searching for a sense of meaning—or a "total" understanding of the world—that remains consistently elusive. In contrast to poststructuralists such as Foucault, for whom the search for knowledge always created a relationship of power and dominance, Baudrillard developed theories in which the excessive, fruitless search for total knowledge lead almost inevitability to a kind of delusion. In Baudrillard's view, the (human) subject may try to understand the (non-human) object, but because the object can only be understood according to what it signifies (and because the process of signification immediately involves a web of other signs from which it is distinguished) this never produces the desired results. The subject, rather, becomes seduced (in the original Latin sense, seducere, to lead away) by the object. He argued that, in the last analysis, a complete understanding of the minutiae of human life is impossible, and when people are seduced into thinking otherwise they become drawn toward a "simulated" version of reality, or, to use one of his neologisms, a state of "hyper-reality." This is not to say that the world becomes unreal, but rather that the the faster and more comprehensively societies begin to bring reality together into one supposedly coherent picure, the more insecure and unstable it looks and the more fearful societies become. Reality, in this sense, "dies out." Accordingly, Baudrillard argued that in late twentieth century, "global" society, the excess of signs and of meaning had caused a (quite paradoxical) effacement of reality. In this world, neither liberal or Marxist utopias are any longer believed in. People live, he argued, not in a "global village," to use Marshall McLuhan's famous phrase, but rather in a world that is ever more easily petrified by even the smallest event. Because the "global" world operates at the level of the exchange of signs and commodities, it becomes ever more blind to symbolic acts such as, for example, terrorism. In Baudrillard's work the symbolic realm (which he develops a perspective on through the anthropolical work of Marcel Mauss and Georges Bataille) is seen as quite distinct from that of signs and signification. Signs can be exchanged like commodities; symbols, on the other hand, operate quite differently: They are exchanged, like gifts, sometimes violently as a form of potlatch. Baudrillard, particularly in his later work, saw the "global" society as without this "symbolic" element, and therefore symbolically (if not militarily) defenseless against acts such as the Rushdie Fatwa or, indeed, the September 11, 2001, terrorist attacks against the United States and its military establishment. In his early books, such as The System of Objects, For a Critique of the Political Economy of the Sign, and The Consumer Society, Baudrillard's main focus is upon consumerism, and how different objects are consumed in different ways. At this time Baudrillard's political perspective was loosely associated with Marxism (and situationism), but in these books he differed from Marx in one significant way. For Baudrillard, it was consumption, rather than production which was the main drive in capitalist society. Baudrillard came to this conclusion by critiquing Marx's concept of "use value." Baudrillard thought that both Marx's and Adam Smith's economic thought accepted the idea of genuine needs relating to genuine uses too easily and too simply. He argued, drawing from Georges Bataille, that needs are constructed, rather than innate. Whereas Marx believed that genuine uses lay beneath capitalism's "commodity fetishism," Baudrillard thought that all purchases, because they always signify something socially, have their fetishistic side. Objects always, he wrote, drawing from Roland Barthes, "say something" about their users. And this was, for him, why consumption was and remains more important than production: Because the "ideological genesis of needs" precedes the production of goods to meet those needs. The first is the functional value of an object; its instrumental purpose. A pen, for instance, writes; and a refrigerator cools. Marx's "use-value" is very similar to this first type of value. The third is the symbolic value of an object; a value that a subject assigns to an object in relation to another subject. A pen might symbolize a student's school graduation gift or a commencement speaker's gift; or a diamond may be a symbol of publicly declared marital love. The last is the sign value of an object; its value within a system of objects. A particular pen may, while having no functional benefit, signify prestige relative to another pen; a diamond ring may have no function at all, but may confer particular social values, such as taste or class. Baudrillard's earlier books were attempts to argue that the first of these two values are not simply associated, but are disrupted by the third and, particularly, the fourth. Later, Baudrillard rejected Marxism totally (The Mirror of Production and Symbolic Exchange and Death). But the focus on the difference between sign value (which relates to commodity exchange) and symbolic value (which relates to Maussian gift exchange) remained in his work up until his death. Indeed it came to play a more and more important role, particularly in his writings on world events. As he developed his work throughout the 1980s, he moved from economically-based theory to the consideration of mediation and mass communications. Although retaining his interest in Saussurean semiotics and the logic of symbolic exchange (as influenced by anthropologist Marcel Mauss) Baudrillard turned his attention to Marshall McLuhan, developing ideas about how the nature of social relations is determined by the forms of communication that a society employs. In so doing, Baudrillard progressed beyond both Saussure's and Roland Barthes's formal semiology to consider the implications of an historically-understood (and thus formless), version of structural semiology. To the simulated "third order of simulacra," whereby the copy has replaced the original. Referring to "On Exactitude in Science," a fable written by Jorge Luis Borges and Adolfo Bioy Casares, he argued that just as for contemporary society the simulated copy had superseded the original object, so, too, the map had come to precede the geographic territory, for example, the first Gulf War: The image of war preceded real war. With such reasoning, he characterized the present age—following Ludwig Feuerbach and Guy Debord—as one of "hyperreality" where the real object has been effaced or superseded, by the signs of its existence. Such an assertion—the one for which he is most criticized—is typical of his "fatal strategy" of attempting to push his theories of society beyond themselves. Rather than saying that hysteria surrounding pedophilia is such that people no longer really understand what childhood is anymore, Baudrillard argued that "the child is no longer a child." Similarly, rather than arguing—as did Susan Sontag in her book On Photography—that the notion of reality has been complicated by the profusion of images of it, Baudrillard asserted: "The real no longer exists." In so saying, he characterized his philosophical challenge as no longer being the Leibnizian question of: "Why is there something, rather than nothing," but, instead: "Why is there nothing, rather than something?" Within a society subject to and ruled by fast-paced electronic communication and global information networks the collapse of this facade was always going to be, he thought, inevitable. Employing a quasi-scientific vocabulary which attracted the ire of the physicist Alan Sokal, Baudrillard wrote that the speed society moved at had destabilized the linearity of history: "We have the particle accelerator that has smashed the referential orbit of things once and for all." In making this argument Baudrillard found some affinity with the postmodern philosophy of Jean-Francois Lyotard, who famously argued that in the late twentieth century, there was no longer any room for "metanarratives." (The triumph of a coming communism being one such metanarrative.) But, in addition to simply lamenting this collapse of history, Baudrillard also went beyond Lyotard and attempted to analyze how the idea of forward progress was being employed in spite of the notion's declining validity. Baudrillard argued that although genuine belief in a universal endpoint of history, wherein all conflicts would find their resolution, had been deemed redundant, universality was still a notion utilized in world politics as an excuse for actions. Universal values which, according to him, no-one any longer believed universal were and are still rhetorically employed to justify otherwise unjustifiable choices. The means, he wrote, are there even though the ends are no longer believed in, and are employed in order to hide the present's harsh realities (or, as he would have put it, unrealities). "In the Enlightenment, universalization was viewed as unlimited growth and forward progress. Today, by contrast, universalization is expressed as a forward escape." Part of Baudrillard's public profile, as both an academic and a political commentator, comes from his deliberately provocative claim, in 1991, that the first Gulf War "did not take place." His argument (greatly criticized by Chris Norris, who perceived denial of empirical events), described the Gulf War as the inverse of the Clausewitzian formula: It was not "the continuation of politics by other means," but "the continuation of the absence of politics by other means." Accordingly, Saddam Hussein was not fighting the Allied Forces, but using the lives of his soldiers as a form of sacrifice to preserve his power (p. 72, 2004 edition). The Allied Forces fighting the Iraqi military forces were merely dropping 10,000 metric tons of bombs daily, as if proving to themselves that there was an enemy to fight (p. 61). So, too, were the Western media complicit, presenting the war in real time, by recycling images of war to propagate the notion that the two enemies, the U.S. (and allies) were actually fighting the Iraqi Army, but, such was not the case: Saddam Hussein did not use his military capacity (the Iraqi Air Force), his politico-military power was not weakened (he suppressed the Kurdish insurgency against Iraq at war's end), so, concluding that politically little had changed in Iraq: The enemy went undefeated, the victors were not victorious, ergo, there was no war: The Gulf War did not occur. Saddam liquidates the communists, Moscow flirts even more with him; he gases the Kurds, it is not held against him; he eliminates the religious cadres, the whole of Islam makes peace with him…. Even … the 100,000 dead will only have been the final decoy that Saddam will have sacrificed, the blood money paid in forfeit according to a calculated equivalence, in order to conserve his power. What is worse is that these dead still serve as an alibi for those who do not want to have been excited for nothing: at least these dead will prove this war was indeed a war and not a shameful and pointless hoax…. This is not a clash of civilizations or religions, and it reaches far beyond Islam and America, on which efforts are being made to focus the conflict in order to create the delusion of a visible confrontation and a solution based upon force. There is indeed a fundamental antagonism here, but one that points past the specter of America (which is perhaps the epicenter, but in no sense the sole embodiment, of globalization) and the specter of Islam (which is not the embodiment of terrorism either) to triumphant globalization battling against itself. Baudrillard thus placed the attacks—as befits his theory of society—in context as a symbolic reaction to the continued expansion of a world based solely upon commodity exchange. This stance was criticized on two counts. First, authors disagreed on whether the attacks were deserved. Richard Wolin (in The Seduction of Unreason) forcefully accused Baudrillard and Slavoj Zizek of all but celebrating the terrorist attacks, essentially claiming that the United States of America received what it deserved. Zizek, however, countered that accusation to Wolin's analysis as a form of intellectual barbarism in the journal, Critical Inquiry, saying that Wolin fails to see the difference between fantasizing about an event and stating that one is deserving of that event. Merrin (in Baudrillard and the Media) argued that Baudrillard's position affords the terrorists a type of moral superiority. 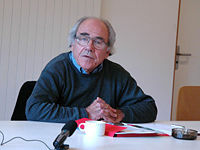 In the journal Economy and Society, Merrin further noted that Baudrillard gives the symbolic facets of society unfair privilege above semiotic concerns. Second, authors questioned whether the attacks were unavoidable. Bruno Latour, in Critical Inquiry argued that Baudrillard believed that their destruction was forced by the society that created them, alluding the Towers were "brought down by their own weight." In Latour's view, this was because Baudrillard conceived only of society in terms of a symbolic and semiotic dualism. Baudrillard's writing, and his uncompromising positions, has led to his being criticized with an almost unprecedented ferocity (possibly only Jacques Lacan has been the subject of so many hostile critiques. Only one of the two major confrontational books on Baudrillard's thought—Christopher Norris's Uncritical Theory: Postmodernism, Intellectuals and the Gulf War—however seeks to reject his media theory and position on "the real" out of hand. The other—Douglas Kellner's Jean Baudrillard: From Marxism to Postmodernism and Beyond—seeks rather to analyze Baudrillard's relation to postmodernism (a concept with which Baudrillard has had a continued, if uneasy and rarely explicit relationship) and to present a Marxist counter. Regarding the former, William Merrin has published more than one denunciation of Norris's position. The latter Baudrillard himself characterized as reductive (in Nicholas Zurbrugg's Jean Baudrillard: Art and Artefact). Willam Merrin's work has presented a more sympathetic critique, which attempts to "place Baudrillard in opposition to himself." Thereby Merrin has argued that Baudrillard's position on semiotic analysis of meaning denies himself his own position on symbolic exchange. Merrin, thus, alludes to the common criticism of post-structuralist work (a criticism not dissimilar in either Baudrillard, Foucault or Deleuze) that emphasizing interrelation as the basis for subjectivity denies the human agency from which social structures necessarily arise. (Alain Badiou and Michel de Certeau have made this point generally, and Barry Sandywell has argued as much in Baudrillard's specific case). Baudrillard's writing up to the mid-1980s is open to several criticisms. He fails to define key terms, such as the code; his writing style is hyperbolic and declarative, often lacking sustained, systematic analysis when it is appropriate; he totalizes his insights, refusing to qualify or delimit his claims. He writes about particular experiences, television images, as if nothing else in society mattered, extrapolating a bleak view of the world from that limited base. He ignores contradictory evidence such as the many benefits afforded by the new media…. Baudrillard is not disputing the trivial issue that reason remains operative in some actions, that if I want to arrive at the next block, for example, I can assume a Newtonian universe (common sense), plan a course of action (to walk straight for X meters, carry out the action, and finally fulfill my goal by arriving at the point in question). What is in doubt is that this sort of thinking enables a historically informed grasp of the present in general. According to Baudrillard, it does not. The concurrent spread of the hyperreal through the media and the collapse of liberal and Marxist politics as the master narratives, deprives the rational subject of its privileged access to truth. In an important sense individuals are no longer citizens, eager to maximize their civil rights, nor proletarians, anticipating the onset of communism. They are rather consumers, and hence the prey of objects as defined by the code. Some writers in their manner and stance intentionally provoke challenge and criticism from their readers. Others just invite you to think. Baudrillard’s hyperprose demands only that you grunt wide-eyed or bewildered assent. He yearns to have intellectual influence, but must fend off any serious analysis of his own writing, remaining free to leap from one bombastic assertion to the next, no matter how brazen. Your place is simply to buy his books, adopt his jargon, and drop his name wherever possible. Baudrillard was one of the leading figures of Postmodernism. Extensive use has been made of his theories of hyperreality. Among those are Native American (Anishinaabe) writer Gerald Vizenor has made extensive use of Baudrillard's concepts of simulation in his critical work, features Baudrillard as a character in a "debwe heart dance" in his novel Hotline Healers It has been claimed that The Matrix, a (1999) film by the Wachowski brothers, was influenced by Baudrillard's thought. One critic went so far as to claim that if "Baudrillard… has not yet embraced the film it may be because he is thinking of suing for a screen credit." Baudrillard himself stated in interviews that The Matrix has nothing to do with his work, and is at best a misreading of his ideas. If imitation is the sincerest form of flattery, then the The Economist of London flattered Baudrillard by publishing a kind and humorous obituary. ↑ Inogolo, How to pronounce Jean Baudrillard. Retrieved October 13, 2007. ↑ Steven Poole, Jean Baudrillard, Guardian Unlimited. Retrieved October 13, 2007. ↑ 3.0 3.1 3.2 Jean Baudrillard, The Intelligence of Evil or the Lucidity Pact (Berg Publishers, 2005, ISBN 978-1845203344). ↑ Barry Sandywell, "Forget Baudrillard," in Theory, Culture and Society (1995, issue 12). ↑ Peter Pericles Trifonas, Barthes and the Empire of Signs, (Icon, 2001). ↑ 6.0 6.1 Jean Baudrillard, The Perfect Crime (Verso, 2008, ISBN 978-1844672035). ↑ Jean Baudrillard, The Transparency of Evil (Verso, 2009, ISBN 978-1844673452). ↑ Jean Baudrillard, For a Critique of the Political Economy of the Sign (Telos Press Publishing, 1981, ISBN 978-0914386247)1983). ↑ Jean Baudrillard, "The Dark Continent of Childhood," Screened Out (Verso, 2002, ISBN 978-1859843857). ↑ 10.0 10.1 Jean Baudrillard, The Illusion of the End (Stanford University Press, 1994, ISBN 978-0804725019). ↑ Denis Dutton, Jean Baudrillard, Philosophy and Literature. Retrieved October 13, 2007. ↑ Gerald Vizenor and A. Robert Lee, Review of Postindian Conversations, Project Muse. Retrieved October 13, 2007. ↑ Gerald Vizenor, Hotline Healers (Wesleyan, 1997, ISBN 978-0819553041). ↑ Adam Gopnik, The Unreal Thing, The New Yorker. Retrieved October 13, 2007. ↑ Brent Staples, Editorial Observer; A French Philosopher Talks Back to Hollywood and 'The Matrix' The New York Times, May 24, 2002. Retrieved May 27, 2015. ↑ Jean Baudrillard, philosopher of consumerism The Economist, March 15, 2007. Retrieved October 12, 2007. Dutton, Denis. "Jean Baudrillard." Philosophy and Literature. 14 (1990): 234-38. Sandywell, Barry. "Forget Baudrillard." In Theory, Culture and Society (1995, issue 12). This page was last modified on 1 May 2018, at 20:24.